국제앰네스티는 1일부터 시행된 전세계적인 확산탄 금지는 지난 10년간의 군축 및 인도 조약 역사상 가장 획기적인 소식이라고 말했다. 확산탄 금지 협약(The Convention on Cluster Munition)은 각 가입국의 확산탄 사용을 금하고, 집속탄 피해자들에 대한 지원 및 소유하고 있는 모든 확산탄의 해체를 권고하고 있으며, 스페인, 일본, 나이지리아, 멕시코, 영국을 포함한 가입국들 사이에서 국제법적 구속력을 갖게 된다. 국제앰네스티 사우로 스카르펠리(Sauro Scarpelli) 무기 캠페인 활동가는 “이번 협약은 무력 충돌 시 집속탄과 같은 잔혹하고 무차별적인 무기로부터 민간인을 보호하기 위한 중요한 발판”이라며 “이번 협약은 1997 대인지뢰금지협약과 함께 전세계의 모든 시민 단체 활동가들의 승리를 의미하며, 각국이 확산탄에 의해 민간인들이 고통 받는 것을 줄이고자 하는 의지를 나타낸다”고 말했다. The worldwide ban on cluster bombs that comes into force on 1 August, marks the most groundbreaking disarmament and humanitarian treaty in over a decade, Amnesty International said On Sunday. The Convention on Cluster Munition, which bans cluster bombs and compels states to assist victims while clearing their land of munition, will become binding international law in countries that have signed and ratified the treaty, including Spain, Japan, Niger, Mexico and the United Kingdom. “This treaty is a crucial step towards protecting civilians, during and after armed conflict, from this cruel and indiscriminate weapon,” said Sauro Scarpellli, Amnesty International weapons campaigner. Amnesty International and hundreds of NGOs and survivors of indiscriminate cluster bomb explosions have been campaigning for a total ban on cluster munition. Adopted in Dublin on 30 May 2008 and opened for signature in Oslo in December 2008, the Convention bans the use, production, stockpiling and transfer of cluster munitions. It also calls for stockpiles to be destroyed within eight years; for cluster munition-contaminated land to be cleared within 10 years; and for assistance to cluster munition survivors and affected communities. To date, 107 countries have signed the Convention and 37 have ratified. Among them are former users and producers of cluster munitions, as well as countries affected by the weapons. 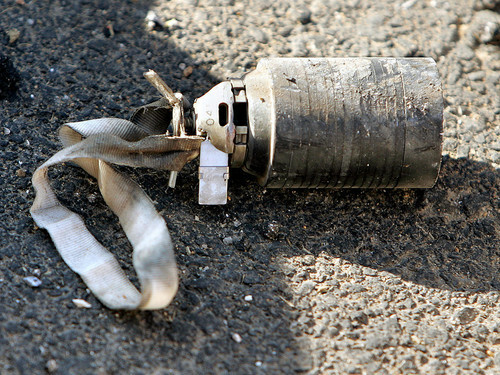 The last confirmed use of cluster munitions in a major armed conflict met with international condemnation when both Russia and Georgia used them in the conflict over South Ossetia in August 2008. In recent weeks, Moldova and Norway destroyed the last of their cluster munition stockpiles, joining Spain, which eradicated its stockpile last year. Nearly a dozen other states have begun destruction, including the United Kingdom, a major former user and producer of cluster munitions. Amnesty International has called on all governments that have not already signed the treaty, to do so immediately and commit to protecting civilians from the deadly effects of armed conflict.